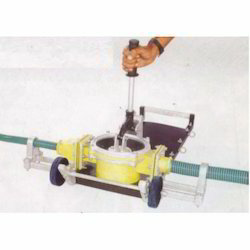 Non Motorized/manually operated pumps used for transfer of corrosive & non corrosive liquids in small capacities where power is not available generally. 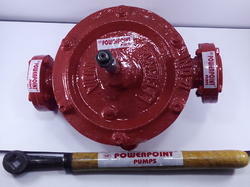 We have a wide range of Diaphragm Hand Pump. The offered diaphragm hand pump is highly liked by the clients, owing to the long lever and easy operation. Our supplied diaphragm hand pump is capable of pumping a variety of liquids such as slurries, viscous and clear liquids. These are cast iron moc hand pumps with Gun metal impellers.Sizes available upto 3 inches.Used in Marine,soap,pharma etc industries. We are a most trusted name in between the topmost companies in this business, instrumental in offering Semi Rotary Hand Pump. 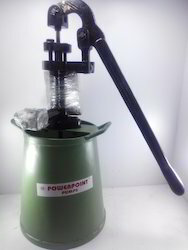 "POWERPOINT" hand operated hydro testing pumps are meant for high pressure Test applications.Available from 35 Bar upto 1000 Bar capacity. We are a coveted organization that is engaged in manufacturing, supplying and trading high quality Hand Operated Hydro Test Pump. Manufactured using high-grade material, our range is in compliance with international quality standards. Moreover, we offer these products to our customers in a spectrum of specifications at industry-leading prices. 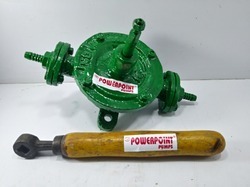 Looking for Hand Pumps ?